Traditional Chinese Medicine is a holistic system of diagnosing, treating and preventing diseases. Fibromyalgia is a textbook example of proving the effectiveness of Chinese Medicine and its ability to treat chronic diseases. According to Chinese Medicine fibromyalgia is a complex syndrome. That means it consists of a combination of several different syndromes which depend on their etiology (origin) and symptoms. One very important pathogenic factor in fibromyalgia is called “dampness”. It is created when the digestive tract cannot process food properly. Dampness gives us a feeling of heaviness, stagnation, fatigue and mental fog. If you remember, serotonin is mostly made in the digestive tract this statement makes sense. Many fibromyalgia patients suffer from IBS (Irritable Bowel Syndrome) and/or present with many digestive issues – bloating, constipation, diarrhea and indigestion are the most common. All of those most irritating symptoms are caused by too much dampness in your belly. Dampness in the body creates stagnation – imagine the resistance when walking through water. In Chinese Medicine theory stagnation or blockage of the smooth flow of energy and blood causes pain. Our body has the natural ability to heal itself – it’s reaction to the increase in dampness is to create heat. If the dampness is too overwhelming this process might be either ineffective after a while or eventually even turn against the body. Heat symptoms include – insomnia, irritability, palpitation and anxiety. These aggravations are very common in fibromyalgia patients. The described processes of creating damp and subsequently creating heat will use up precious resources – energy and nutrients. Over time the body gets weaker and less energized. Even activities of daily living can become a huge burden. Lack of energy directly impacts the immune system making the body more prone to infections. This vicious cycle, once in place, is difficult to brake. After a diagnosis has been established, we create an individualized treatment plan, which includes all afore mentioned modalities. Patient commitment and compliance in the established treatment plan is crucial for positive results. Without a healthy diet, there is no way to treat fibromyalgia successfully. The general rule is to drastically limit simple carbohydrates. 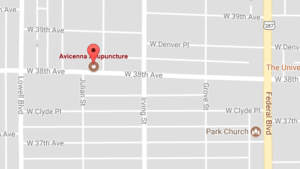 At Avicenna Acupuncture Clinic we provide specific dietary recommendations to each patient. Sometimes we recommend a “cleanse” that will help to detoxify the body and regulate the digestive tract. It is like resetting the digestive system to a new pace. This will clear up many of the digestive issues. Acupuncture has an analgesic (pain reducing) effect, which is caused by the endorphin release. It increases the blood flow to sore muscles. It balances the neurotransmitters in the brain and therefore reduces feelings of depression, anxiety, fatigue and brain fog. It is common that after an acupuncture treatment patients have more energy and better focus. Acupuncture regulates the digestive tract. This is a very important function, because it not only helps with the symptoms but also improves absorption of nutrients and supplements. This in consequence will increase your immune system. There is a vast amount of beneficial supplements. Generally the supplements will help your body to establish a healthy digestive tract and immune system. Since we treat every patient individually it is impossible to write a generic list of recommended supplements. What works for your neighbor or friends, might not work for you. You can find information and updates on the supplement page. Physical activity – This is the best, cheapest, easiest, most effective and my favorite treatment method. I didn’t use the word “Exercise” on purpose. It is not about training, it is about physical activity. Make a list of things you enjoy. Any kind of recreational activity counts. The keywords here are FUN and ACTIVE. For some people being active means running a marathon, for others walking or biking around the block. Fibromyalgia patients have difficulty being active. Sometimes getting out of bed is a huge effort. When you hurt all over you don’t want to do anything. Do it anyway; start small and build up from there. DILIGENCE is another keyword. Be active every day, no matter what. As a Chinese Medicine practitioner, I cannot miss this opportunity to introduce “Tai Chi”. This exercise system originated in China and has been practiced for centuries. Tai Chi consists of a sequence of simple movements that are easy and not strenuous. It balances and strengthens the body, helps with pain, elevates your mood and energy level. Tai Chi can be practiced in a group or individually. Another great activity is Yoga. It can be a little more demanding and finding a good teacher is crucial. If you have questions about fibromyalgia please contact us or sign up for a free consultation.